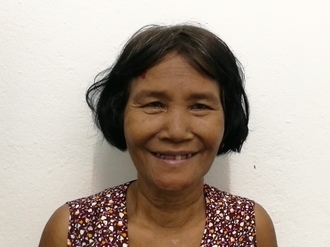 Khem from Cambodia raised $225 for vision-restoring cataract surgery. Khem's treatment was fully funded on May 7, 2016. Khem received vision-restoring cataract surgery. Khem had one of his cataracts removed in a short procedure, during which his clouded lens was removed and replaced with a clear, artificial implant. 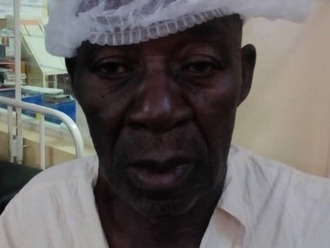 Though scheduled to have both cataracts treated, he has yet to return to receive his second surgery. It can take patients some time to return for follow-up care for any number of reasons. Patients often live far away, or have important family matters that keep them from coming back to the clinic. Whenever Khem returns, his second surgery will be free. Khem is a 70-year-old man from Cambodia who spends his time working at the pagoda. He is married with 8 daughters and 35 grandchildren. He enjoys reading the Buddhist text and cleaning the pagoda. One year ago, Khem developed a cataract in each eye. This causes him to be partially blind, experience tearing and have cloudy lenses. He can’t see clearly, do work well, or go outside on his own. Khem traveled two hours to our medical partner, Children’s Surgical Centre, with his wife. He learned a simple surgical procedure can restore his sight. For $225, Khem will receive cataract surgery. Doctors will remove the old, cloudy lenses from his eyes and replace them with clear, artificial implants. Khem's case was submitted by Hannah Callas at Children's Surgical Centre in Cambodia. Khem was submitted by Hannah Callas, Stakeholder Relations Officer at Children's Surgical Centre, our medical partner in Cambodia. Khem was scheduled to receive treatment at Kien Khleang National Rehabilitation Centre. Medical partners often provide care to patients accepted by Watsi before those patients are fully funded, operating under the guarantee that the cost of care will be paid for by donors. Khem's profile was published to start raising funds. Khem's treatment was fully funded. Khem's treatment was started but not completed. Read the update.